Identification: Saltcedar is a handsome deciduous tree (or shrub) with long slender branches and deep pink flowers. It is long-lived (50-100 years) and grows to 6 to 26 feet (2-8m) tall. The branches often form thickets many feet wide. The narrow leaves are small (1.5cm) and grayish green, often overlapping and crowding on the stems. Although the leaves have the appearance of an evergreen, they are actually deciduous. 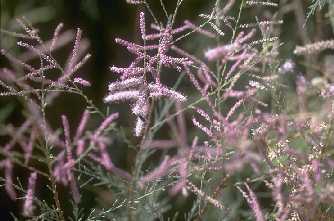 The ramosissima species can be distinguished from other Tamarix by the 5 toothed sepals. The deep pink to almost white flowers crowd in many slender spikes, forming dense masses at the top of the branches. The flowers are about 1.5mm across, and have 5 petals. The seedpods are pinkish red to greenish yellow, and will break into 3 to 5 parts when mature. A tuft of fine silky hairs adorns the tip of the tiny seeds (<1mm). The saltcedar's bark is a reddish brown while the wood is soft and white. The smooth bark ridges and furrows with age. 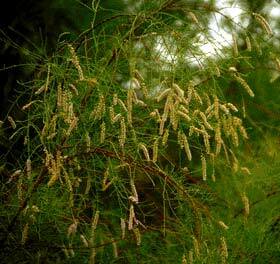 Tamarix have a deep taproot and extensive lateral rhizomes, which profusely branch upon contact with water. 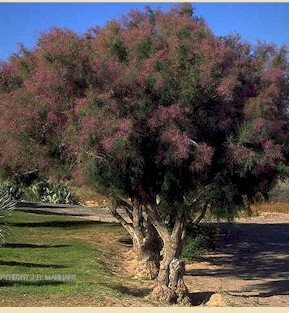 Tamarix is the old Latin name; ramosissima means "most densely branched". Original Distribution: Saltcedar is native to Eurasia. It can be located in a zone stretching from the Mediterranean region (southern Europe and north Africa) through the Middle East and central Asia to northern China and Japan. There are a few species in disjunct parts of Africa. 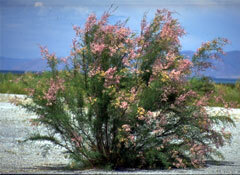 Tamarisk typically occupies sites with intermediate moisture, high water tables, and minimal erosion. 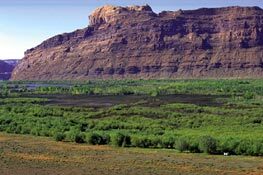 Saltcedar mainly occurs along floodplains, riverbanks, stream courses, salt flats, marshes, and irrigation ditches in arid regions of the Southwest. It often forms pure stands in disturbed riparian areas of the Southwest. In the Great Plains, saltcedar is common along streams, in low undrained areas, and around lakeshores, especially in the Arkansas and Cimarron river valleys and is occasionally found on dry hillsides. Its roots may penetrate soil 30 feet but it generally grows where the depth of the water table does not exceed 25 feet (7.6 m), and normally where it is less than 15 feet (4.6 m). Dense stands will grow only where the water table is between 5 and 20 feet (1.5-6 m) below the soil surface. If the water table is less than 5 feet (1.5 m) from the surface, the plants branch profusely and do not form a dense stand. Saltcedar grows well on moist sandy, sandy loam, loamy, and clayey soil textures. It has a wide range of tolerance to saline and alkaline soil and water. It has been found growing in Death Valley, California, where the groundwater contains as much as 5 percent dissolved solids. Site and Date of Introduction: It is believed that nurserymen on the East Coast made the first introduction of saltcedar to North America in 1823. It was planted as an ornamental in the western U.S., but by the 1870's, it was reported to have escaped cultivation. By 1900 it was being used to control erosion on the banks of the Colorado River and Rio Grande. Spread Timeline, from "Invasive Plants Factbook, Deserts"
1800s. In the early 1800s, eight species of saltcedar were introduced into the United States from Asia. Three of these species, including T. ramosissima, became invasive. 1940s. 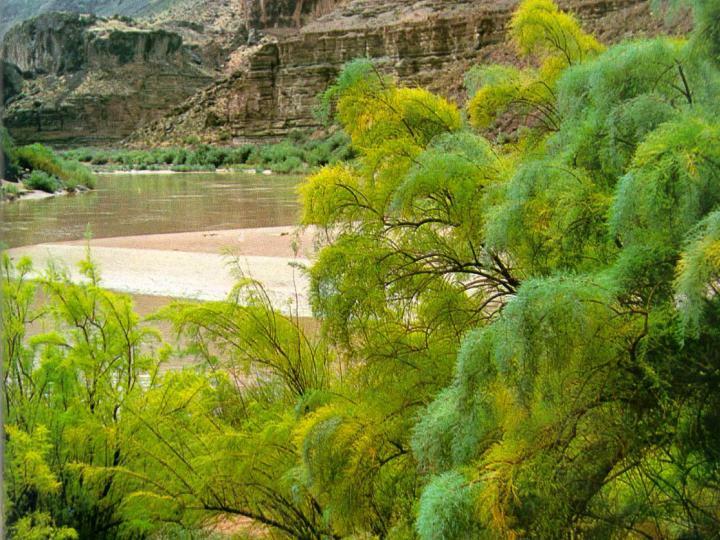 These three species of saltcedar had spread extensively along the Gila, Salt, Pecos, Colorado, and Rio Grande rivers. The construction of dams and flood control structures along these rivers altered natural flooding regimes and provided ideal conditions for the establishment, reproduction, and growth of saltcedar. 1960s. By 1961, at least 1,400 square miles of floodplain in the western United States were infested by saltcedar. Since the 1960s, 70% of the original native vegetation in Afton Canyon, California, has been replaced by saltcedar. Reduced river flows, off-road vehicles, year-round grazing, and native tree cutting may have permitted the establishment and spread of saltcedar in such areas. 1970s and 1980s. Saltcedar has moved into interior desert riparian habitats that are relatively undisturbed by human activities. 1998. Saltcedars have successfully invaded nearly every drainage system in arid and semi-arid areas in the southwestern United States and occupy over 1 million acres. Saltcedars now occupy most suitable habitat west of the Great Plains, north into Montana, and south into northwestern Mexico. Mode(s) of Introduction: It was brought over from Eurasia and planted in the US as an ornamental as well as for use as wind breaks, creating shade, and stabilize eroding stream banks. It escaped cultivation soon after, more than likely through natural means (e.g. dispersal of seeds to new areas from cultivated stands). Reason Why it has Become Established: Saltcedar, like many other invasive plant species, has a great reproductive capability. A mature saltcedar plant can produce 600,000 seeds annually, and has the ability to flower during its first year. Seeds are easily dispersed by wind and water, and severed stems and shoots of saltcedar readily root in moist soil. The plant's ability to exploit suitable germinating conditions over a long time period gives saltcedar a considerable advantage over native riparian species. A very rapid grower, saltcedar can grow 9 to 12 feet in a single season under good conditions. Rapid growth can allow the invading plant to reproduce within the first year. In extreme environmental conditions such as drought or flooding, it is extremely resistant. Under drought, saltcedar survives by dropping its leaves and halting growth. Additionally, its seedlings are very resistant to desiccation. Under flooding, it can survive immersion for up to 70 days. Mature plants can resprout vegetatively after fire, flood, or treatment with herbicides and can adapt to wide variations in soil and mineral gradients. Saltcedar also deposits salt above and below the ground, forming a saline crust inhibiting other plants from growing in its vicinity. In addition to outcompeting native species, this also enables the saltcedar to cope with high concentrations of dissolved solids. Ecological Role: The following species are sometimes found with saltcedar: sandbar willow (Salix exigua), New Mexico forestiera (Forestiera neomexicana), Fremont cottonwood (Populus fremontii), boxelder (Acer negundo), Gambel oak (Quercus gambelii), fourwing saltbrush (Atriplex canescens), greasewood (Sarcobatus vermiculatus), salt grass (Distichlis stricta), and rabbitfootgrass (Polypogon monspeliensis). Little is known about its place in the natural succession of the floodplain community. It appears that saltcedar is a pioneer or colonizing species that establishes on freshly exposed alluvium, sand and gravel bars, and streambanks or other floodplains after disturbance. Saltcedar is a slow starter that does not compete well in established communities. Saltcedar is a fire-adapted species and sprouts vigorously after burning. Flowering and seed production increases after fire. Without frequent flooding, saltcedar communities accumulate litter rapidly and can burn every 16 to 20 years. Fire prevents most saltcedar stands from either reaching maturity or persisting as mature communities. Native riparian vegetation is usually replaced by saltcedar after a fire, established on burned sites through off-site seed sources. rehabilitation of disturbed sites when very carefully monitored - it is one of few species that can aggressively colonize and stabilize extremely saline soils. Under very special and controlled circumstances, land managers might consider using saltcedar for land stabilization purposes. Riparian ecosystems have been so detrimentally affected by saltcedar and other factors that they may possibly be the rarest ecosystem in North America. The monotypic stands of saltcedar aggressively replace willows, cottonwoods, seepwillow/baccharis and other native riparian vegetation. Saltcedar is a very great consumer of water: a single large plant can absorb 200 gallons of water a day. This can result in the lowering of the ground water, drying up of springs and marshy areas, as well as reduction in water yield of riparian areas (along the Colorado River it has been estimated that up to 568,000 acre feet of water are lost per year to channel vegetation, with saltcedar being a major component). Saltcedar's dense roots can slow down river flow, increasing deposition, and increasing sediments along the riverbank. This can lead to saltcedar colonization further into the floodplain, widening the riparian zone, resulting in severe reduction of streamflow or even rechanneling. On the other hand, saltcedar root systems can also lead to flooding through choking of the watercourse. Although it can provide nesting area for some species, avian density and diversity decreases dramatically when saltcedar is present. It has been found that saltcedar stands supported only four species per hundred acres, in comparison to 154 species per hundred acres of native vegetation. Saltcedar communities also tend to have smaller numbers of insects as well. Although much of the current distribution is already choked with saltcedar, it remains a high priority species because of the continued harm it does to native riparian ecosystems. Efforts should be undertaken to reclaim these extremely important and endangered ecosystems from aggressive species like the saltcedar. Control Method: Saltcedar is difficult or impossible to kill by burning, drought, freezing, hypersalinity, prolonged submersion, or repeated cutting at ground level. However, it can possibly be controlled through a combination of methods. Because saltcedar can very effectively resprout from roots or cut stems, simple removal of the plant is largely unsuccessful. Cutting down the tree in combination with direct chemical treatment of the stump with various herbicides (those shown to be effective against saltcedar) has been successful. Some studies in New Mexico have also described arial chemical treatment as able to achieve "90-99% control." Prescribed burning alone is not an effective control method for saltcedar because it generally promotes sprouting and flowering. However, burning followed by herbicide application has been shown to be effective. Research has indicated that approximately a dozen insect species are available that might be useful in fighting saltcedar, but none are presently available. Two species in consideration are: saltcedar leaf beetle (Diorhabda elongat), and manna scale (Trabutina mannipara). In its native range, 115 insect species and four mites are known to attack saltcedar. By feeding on the saltcedar, the biocontrol insects could have a great impact on population growth.